Animal rights group, anti diary campaigners, bobby calf rescue. Lynley Tulloch (PhD) is an independent writer whose expertise scans topics as diverse as the environment, education, social justice and animal rights. Lynley lectured at the University of Waikato for eleven years on environmental education. 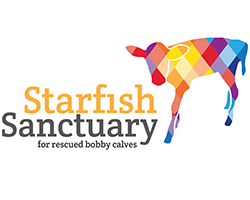 She is the founder of Starfish Bobby Calf Project, a vegan animal rights group. Would you like some sea lions with your squid rings? Let's have the Morrinsville Mega Cow as Santa this year! Awkward angles – it’s time to tell the truth about dairying!